How multilingual is steemit ? 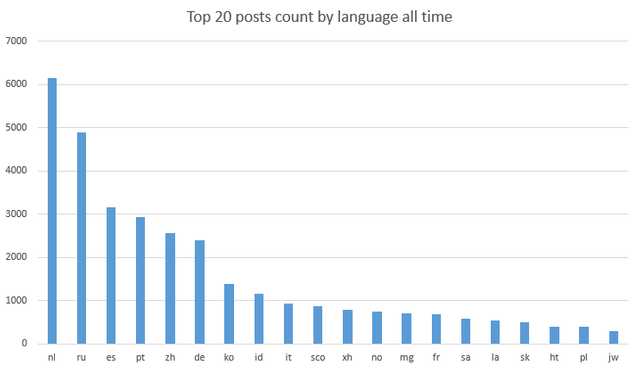 Do you ever wondered what language is the most used in Steemit? English is not the only language used by steemians, even if it is obviously the #1. Some posts are written in "foreign" languages and may even contains multiple languages. OK, there are some unexpected languages in this chart. Please keep in mind that language detection is not always perfect and sometimes got tricked when there are not enough words in a posts. And the winner is ... Dutch! Mate, calm down a bit before to rush headlong into it. Have a look at the following chart first. 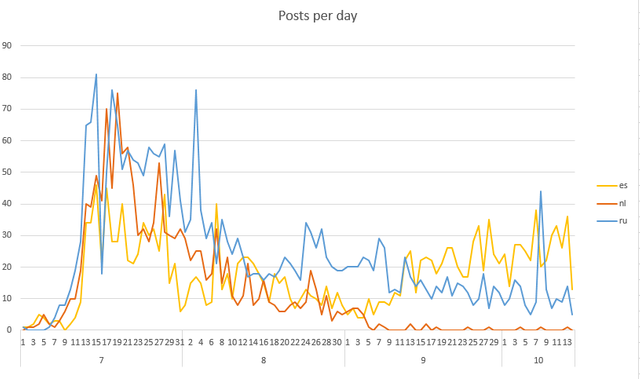 It shows daily posts count for the top 3 languages starting from July (data before July are quite irrelevant). What we see is that the Dutch community has been the most active in July, followed by the Russian community. But they slowly declined starting mid-July to become pretty mute nowadays. Look at the Spanish’s posts! As for other languages, there has been a decline but less important. 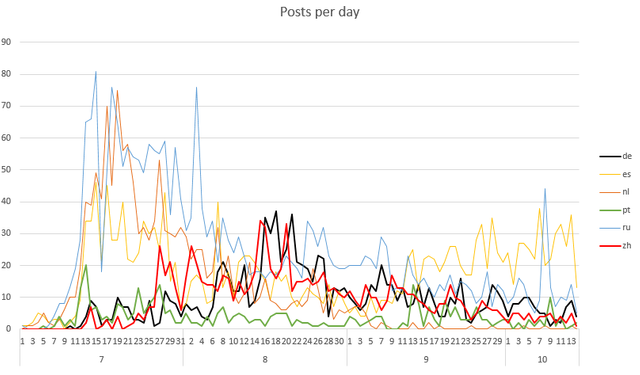 Moreover, starting September, the number of Spanish posts got higher and higher and this community is now dominating since mid-September. Sorry @roelandp but your fellow Dutch language authors have hard work to do and come back pole position. Hopefully SteemFest will help the emergence of new Dutch writers. Here the same graph with the top 6 languages altogether. Chinese and German community did their best mid-August, outshining current best performers. Unfortunately, they have failed to keep pace and are now on a downward trend. Want to know who are the top "foreign" language authors this month? Go on steemians, there is a place for language diversity on steemit. Follow the Spanish community example and write in your own language. There are also several English authors who explicitly authorize the translation of their posts as part of Operation Translation, a project initiated by @papa-pepper. The author of the translation get the rewards if the translation is upvoted. Let's make steemit community truly multilingual. I hope you enjoyed reading this post. I stated in my witness thread, I'm committed to help non-English communities to develop. Excellent report and thanks so much for mentioning Operation Translation. Authors from any language may join in, as there is no reason not to have Chinese posts translated into French, Russian posts translated into Spanish, German posts translated into English, and so on. Thanks for all that you do @arcange! Thanks @papa-pepper. Of course this post is translation authorized. I would be amazed to see my post translated in Chinese. There was some interest when I mentioned Operation Translation from the Chinese community, but I have not seen anything come through yet. It is amazing to see a post suddenly be available in other languages. Also, I'll fully support any witness who is committed to building up the international community, so you'll get my vote for witness. I was wondering, but was on the mobile, so I couldn't check at the time. Thank you for your work, this is quite encouraging! How did you make the statistics? That is, how do you figure out which language a post has? Unbelievable. I see mostly English posts. Perhaps because I want to see them. From where did you get the figures? What is the up dated version?